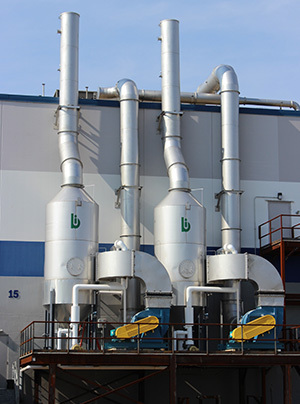 Bionomic Industries, Inc., an industry-leading manufacturer of proven air pollution abatement, product, and heat recovery technologies, has announced availability of their new high performance Series 9000 Preformed Spray Scrubber. Designed to simultaneously remove solid and gaseous particulates from dryers and other processing operations, the Series 9000 features a specially designed fine droplet scrubbing liquid spray zone within a confined involute section that eliminates any bypass of untreated gas. A fully open, cyclonic entrainment removal section without internal droplet removal components makes the scrubber highly reliable with extremely low maintenance. The scrubber consumes less energy than a venturi scrubber, is designed to meet PM 2.5 and PM 10 regulations for particulate in the 1 to over 5 micron range, and is available in sizes to handle gas volumes from 1,000 through 75,000 cfm.